In 1897, in retaliation for the ambush of an ill-advised British diplomatic mission to the Kingdom of Benin in Nigeria, Britain attacked the capital. During the subsequent conquest, which marked the end of the Old Kingdom, thousands of sculptures were confiscated as “barbaric” and sent to Europe. The Menil’s tusk was among over 130 similar full-length carved ivories that were seized at that time. Few records were kept to describe the source of any of the artworks that were removed from Benin, but certain facts can be assumed about this tusk based on Benin’s customs, oral history, and the motifs carved upon its surface. It was apparently part of a memorial shrine established in the late eighteenth century by an extremely wealthy ezomo, the highest-ranking hereditary war captain of the kingdom. The shrine would have contained ancestral altars dedicated to the ezomo’s father and grandfather. Each set of Benin altar tusks bears distinctive motifs that are arranged in similar order. The Menil tusk was one of the smaller in a set of at least eight carved ivories that stood upright on bronze pedestal heads, which were placed on the hardened clay altar. There were originally seven rows of carved motifs, but the bottom row has been cut off, probably because the base had broken. The point of the tusk is also damaged. 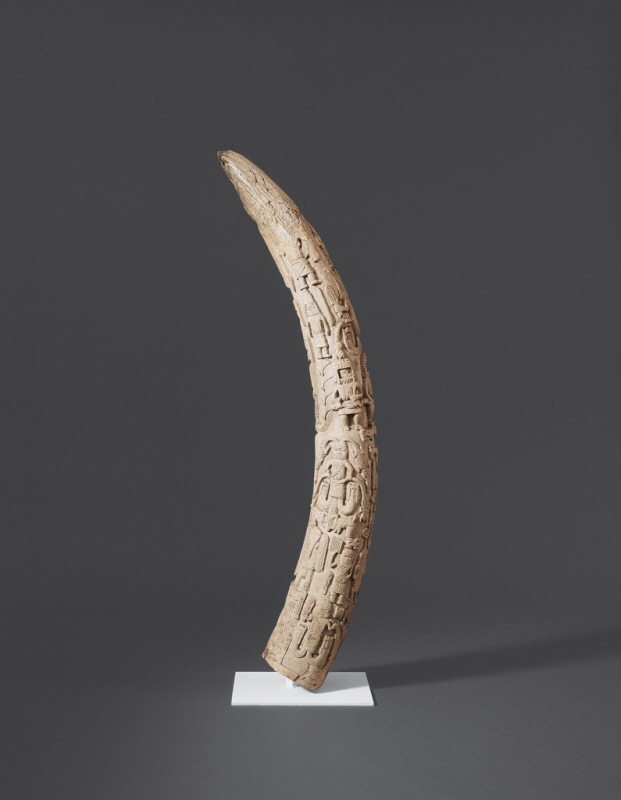 All ancestral tusks contain mythological references to the spiritual powers of Benin’s divine kings, and two royal heraldic figures are prominent on this ivory. Their fish-like legs curve upward, and double-headed serpents lie across their waists. Another essential motif, used only by successive ezomos, appears twice at the bottom of the tusk. This figure has the curved legs usually reserved for royal heraldic emblems, but it has no crown and no royal bead appears at the center of his chest. Issuing from the side of his head, a serpent descends to grasp a bird. This unique motif, which would be “ungrammatical” on a royal tusk, indicates the ambiguous semi-royal status held by the successive holders of the ezomo’s title. Another motif that is unique to tusks commissioned by an ezomo is a strange human-elephant apparition that appears on the left side, in the second row from the bottom, next to the image of a woman who holds up a rectangular mirror-charm. This elephant motif is identified in present-day Benin as a symbol of a dangerous opponent that the ezomo finally overcame after increasingly desperate battles to save Benin’s monarchy. In Benin belief, this powerful rebel was a sorcerer who often prevailed in warfare by transforming himself into an elephant. In Benin today, close access to these carved altar tusks is still restricted to the ritual specialists who are assigned to care for them. Although the motifs are not interpreted for the public, certain palace initiates have an understanding of the carved figures, including the highest-ranking artists in Benin’s hereditary ivory carving guild, the Igbesanmwan.